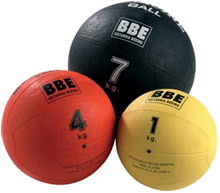 The use of the medicine ball has grown as the demand for equipment to execute compound exercises has risen. This is particularly true among athletes training to gain an edge in their respective sport. Medicine balls vary is size but will usually not be larger than a basketball. The size generally relates to weight amount but this is not always the case. Some units are all the same with numbers on the individual balls declaring their weight. The medicine ball is often made from rubber giving it the ability to bounce as this can be a common tactic used when training. If you are looking for the larger ball to perform exercises, head over to the exercise ball piece of equipment. The use of a medicine ball can increase the difficulty in a variety of ab exercises. The most popular exercise the medicine ball is used would be decline sit-ups. The ball is held to the chest as the individual performs the exercise. The added weight causes additional resistance making the exercise more difficult leading to more intense muscle usage. Twisting motions are also quite popular with the medicine ball to target the oblique muscles. Athletes who play soccer or basketball tend to make use of medicine balls to simulate motions that occur during a game. For soccer players, the overhead toss-in requires a great deal of shoulder strength to generate sufficient torque to propel the ball. Training with a medicine ball and a workout buddy can greatly aid in this department. By using the same throwing motion in game while training, one can build up their shoulder strength by tossing the ball back and forth with their partner. As for basketball, executing a pass that utilizes a pushing motion is very common. Passing the ball simulates a variety of chest exercises used in conjunction with shoulder exercises. By using a medicine ball, the athlete is able to use all the muscles he or she will need in game and increases their ability to pass the ball more quickly. Due to the weighted nature of the medicine ball, caution should be taken when performing exercises with them, especially if using it to pass back and forth as an exercise. The added weight can easily lead to jammed or even broken fingers. It is also possible to lose one's balance as a result of the force behind the pass. If you are performing abdominal exercises with the ball, be sure to maintain control of it after the set is complete as it can easily roll away and lead to someone potentially tripping on it.